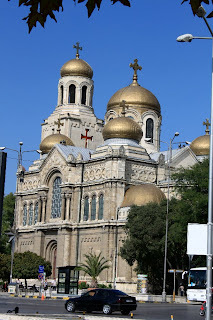 We stood in front of the Cathedral of the Assumption in the center of Varna and watched for a sign that would show us where the free walking tour would begin. 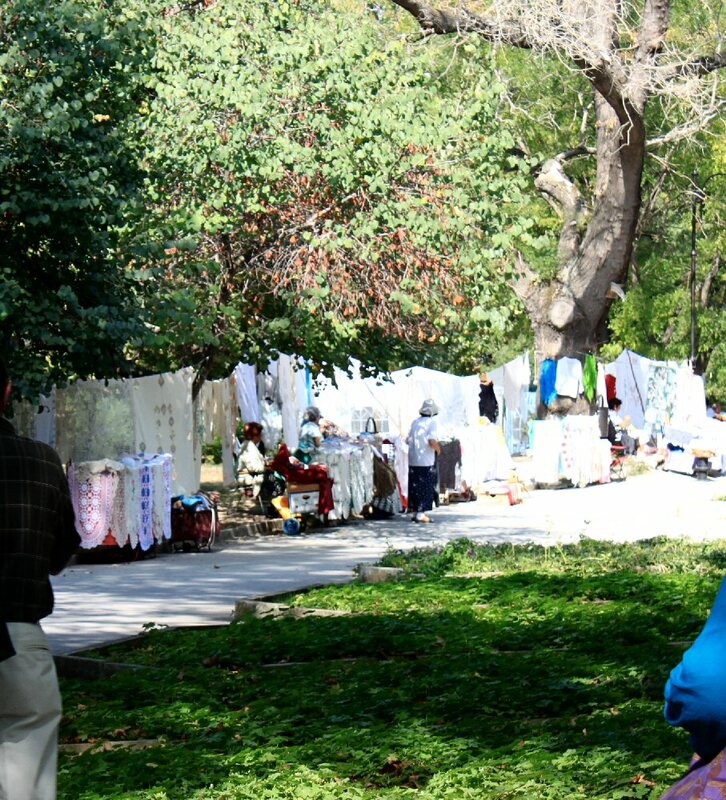 All of a sudden my eyes caught sight of a young gentleman standing on the steps with a "Free Varna Tour" sign held in front of him. With a sigh of relief, we walked over to him and were joined by quite a few others in the crowd milling about the Cathedral looking for the same sign. 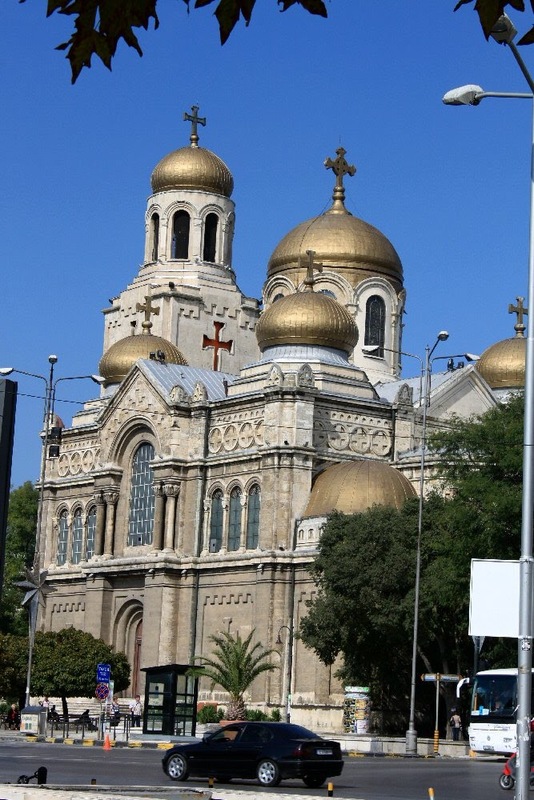 Nicky began by giving us some background history to the Cathedral as well as Varna. He was very engaging and extremely knowledgeable as we learned as our tour went on. He led us into the Cathedral one more time. I was surprised to see that all the lights that had illuminated the sanctuary were now off. Apparently the tour buses were done for the morning. We walked around once again under the watchful eyes of the two ladies in charge of the picture takers and back out again. Across the street, we stopped for a bit more history just as the sun began to break through. 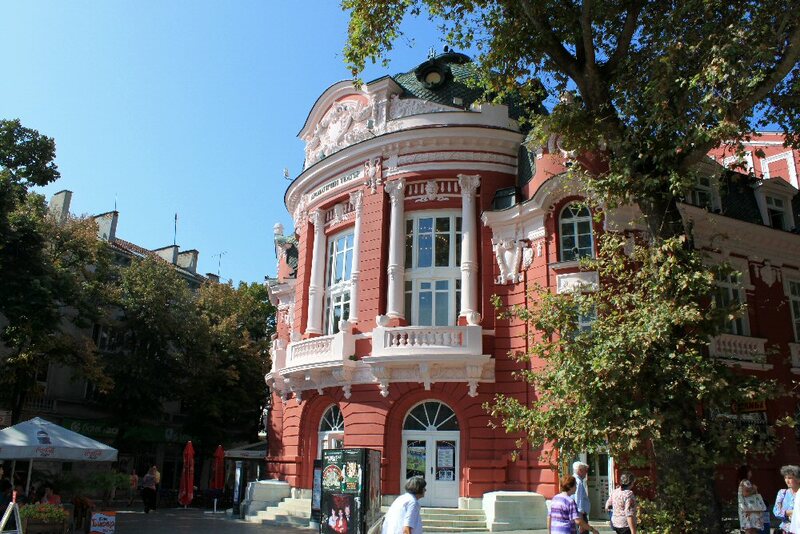 Varna looked much nicer in the sunshine. (I found that to be true in Venice as well). Before we moved on, a plain-clothed cop took Nicky aside and pulled out his badge. They spoke in their native language and when Nicky returned to the group, he told us that the police wanted to warn us of being approached by people who wanted to exchange money with you. Once you gave them the money, they would take it and either short change you or not give you money back. Those that we had met earlier who we thought were panhandling were actually scammers. We started down the pedestrian was and passed by a museum and a beautiful red colored theater, one of several that were in the area. More people were now in the pedestrian way and now that the shops were open, the sun was out, and we were in a group, it didn't seem so intimidating. There was less graffiti along the side streets we traveled to visit several small Armenian churches that were very old. Along the way we lost the group of students that had started out with us. I'm guessing there was more history than they wanted to hear. And there were a couple in our group who disagreed with some of the statements that Nicky made about past conflicts with other countries/groups of people and Communism. They weren't willing to let him have his opinion and they dropped out of the tour as well. He really wasn't political--just relaying the history as he'd learned it. 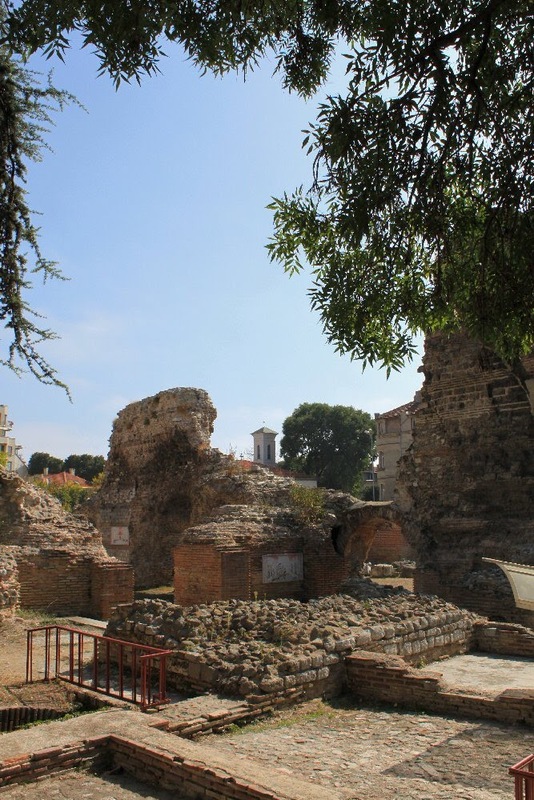 Probably the most interesting place was the huge area of remains unearthed of a Roman bath. It was quite a spa in its day and we heard how water was transported there and heated for the wealthy to enjoy. 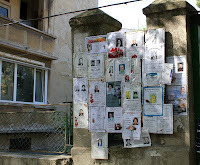 In front of one of the churches, we came across a bulletin board of sorts with all kinds of leaflets with people's pictures on them. Nicky explained that instead of putting obituaries in a newspaper, family members posted them at the church or on trees or telephone poles through out the city in memory of them and as a way of letting others know they had passed. 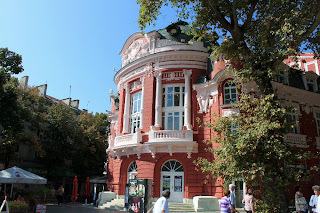 As we paused in front of an old museum, Nicky stopped to talk about the Cyrillic alphabet used in Bulgaria. It was invented in the 10th century to write the old church Slavic language. It has evolved over the years and been adapted to use in over 50 different languages mainly in Russia, Eastern Europe, and Central Asia. 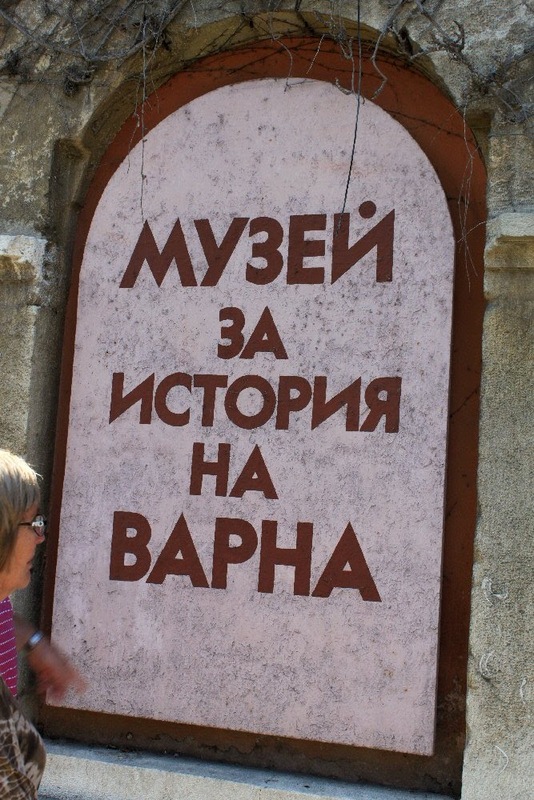 The last word on the sign pictured is Varna. Our wandering took us back to the port area. I hadn't realized that we weren't that far away. 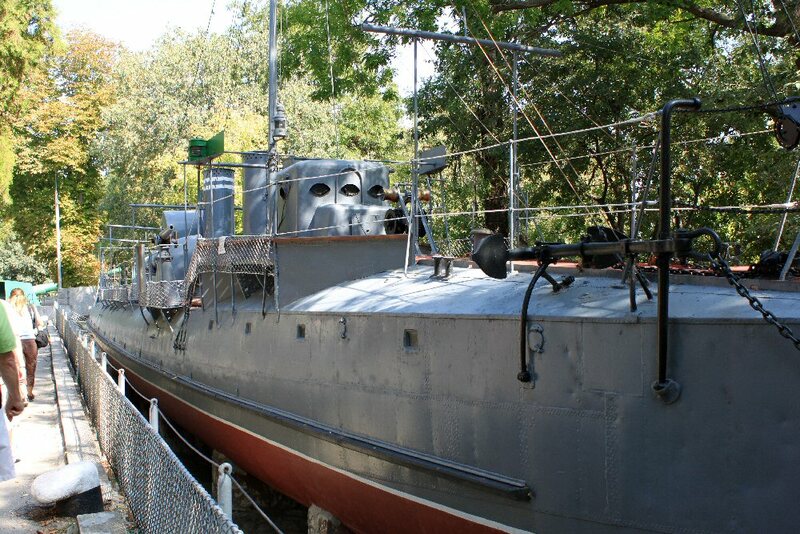 Near the port is beautiful Primorski Park with an outdoor Naval Museum and Aquarium. It sits on the shore next to the city beach. We walked through and stopped to look at some of the historical pieces of equipment and then continued back to another pedestrian area where Nicky ended his tour in front of the McDonald's. He pointed out the good shopping areas and how to get to the Cathedral for the shuttle or to walk back down to the ship. We thanked him, gave him some money for his time and set off to find something Bulgarian to eat. There were lots of choices in this area just a ways from the park. We settled on one that said free WiFi and sat down. 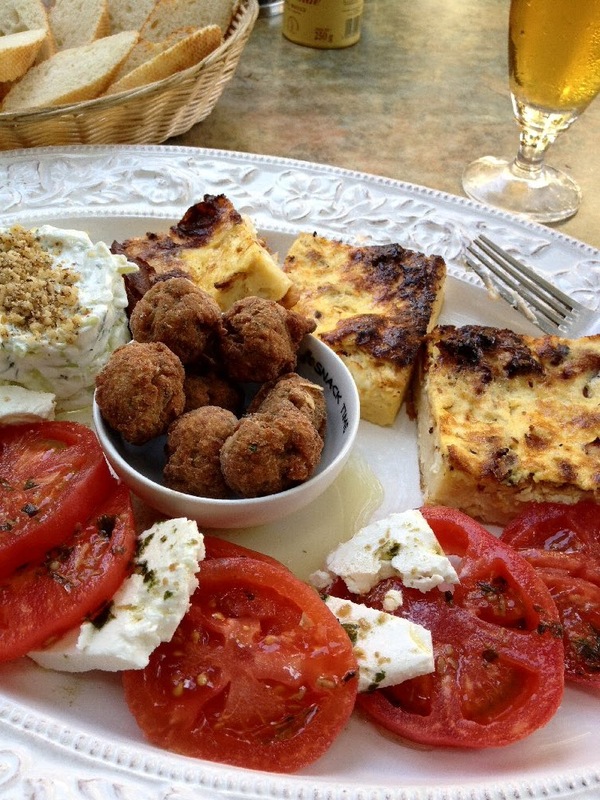 Our waiter spoke pretty good English and suggested we try a plate that was a Bulgarian sample. It was great! Sweet tomatoes with some kind of goat cheese, cucumbers and sour cream like my mother used to make (ours was Bohemian style), deep fried pork balls, and something that was like a quiche. It was all very good and we enjoyed each bite. In the park I had noticed lots of ladies who had set up shop with all of their handcrafted and crocheted items. I don't normally get souvenirs, especially for myself, but I couldn't resist a small crocheted table scarf. We made our purchase and strolled through the shaded park back to the port entrance to our ship. 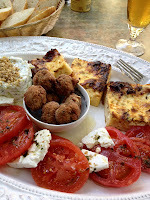 What had started out as a dreary and uncertain day had turned into a wonderful excursion and a great taste of Bulgaria.